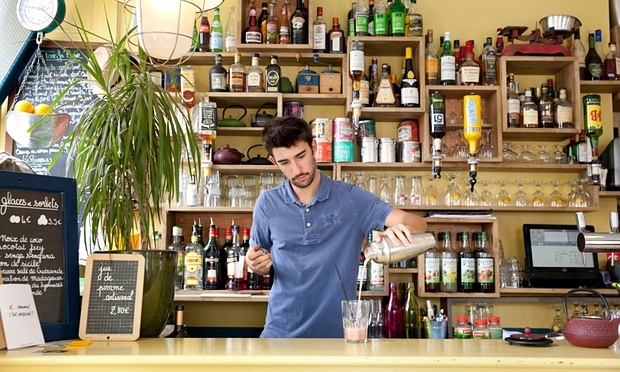 Where to eat / drink in Lyon | C'est super! Aprender francês online: rápido e fácil! Lyon is known for the great gastronomic tradition of bouchons, traditional taverns of a kind that these days I rarely visit. But most bouchons are pretty poor, and I don’t they do the city’s image any favours (there are places being opened up by talented young chefs that deserve more attention). There are exceptions to this rule, however. For “real” Lyonnaise cuisine, I’d recommend Le Garet (7 rue du Garet, no website). It’s typical of the city and a bit twee – with its wood panelling, checked tablecloths and suitably gruff owner. You eat packed together in a convivial atmosphere. Another bouchon I like is Daniel et Denise (156 rue de Crèqui) in the old town. Its chef is Joseph Viola, winner of a prestigious Meilleur Ouvrier de France award (best craftsman of France) and his cooking is exceptional. 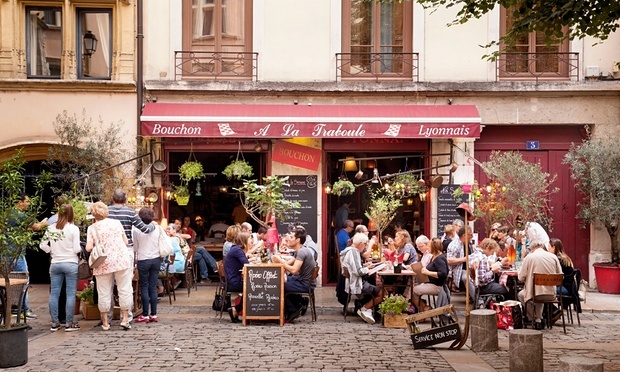 The 7th arrondissement, where I live, is flourishing culturally and has lots of informal bistro-type restaurants, which are much more my kind of thing for everyday eating. In the three years I have lived here I’ve seen the opening of loads of little places that are worth seeking out. There’s Les Pralins (62 rue Sébastien Gryphe), for Sunday brunch; le Stamtich (44 rue Raulin), where you can eat real flammekueche (a sort of Alsatian pizza) and sumptuous banoffee pie; and Nam Sandwich (12 Place Raspail), where you can get a tasty banh mi Vietnamese sandwich to take away and eat by the Rhône. For something a bit more exotic, try Chez Terra (81 rue Duguesclin) in the 6th arrondissement: it’s a brilliant Japanese restaurant where the menu is short, but everything’s delicious. Then there’s Doshilack (28 rue de Marseilles), in the multicultural Guillotière district, for divine Korean food. For drinks, head for Le Bistrot des Fauves (29 rue Saint Michael), which does good beer. Sit at one of several mismatched tables and enjoy it with a very good plate of cheese and charcuterie. It puts on exhibitions from time to time, there are magazines lying around and the clientele is quite boho. But my true favourite is Le Kitchen Café (34 rue Chevreul), a stone’s throw from my house. The cooking is Franco-Swedish, all made with locally grown produce. It has old sewing machines as lamp stands and table legs, and is a very popular meeting place. The coffee is good, and I always go for the homemade patisserie: cookies, financiers (almond sponge cakes) and petit fours are all top class, at reasonable prices. Close to the Gare de Lyon-Perrache, Café Marmot (51 rue de la Charité) is also worth a trip. Its cookies are delicious and the atmosphere is friendly. Le Palégrié (8 rue du Palais Grillet) is a bit like Le Kitchen Café, with reasonable prices. It’s a simple but very refined little place, where the staff can advise on the choice of excellent wines. 1 Response to "Where to eat / drink in Lyon"
Salut, très bonnes adresses en effets. Je ne manquerai pas prochainement de faire référence à ce post. En complément, sur le bouchon Daniel et Denise, voici un lien vers un article récemment publié avec de belles photos de produits et plats proposés : https://millionssquarefeet.wordpress.com/2015/09/23/bouchon-lyonnais-plus-plus/. Ça donne faim.